Member Sign In Register Now! You can not add more websites as your subscription date is Expired. For add more websites & keywords, please. Click here! Updating your website's rankings for the new keyword/s. Be cool ! You are allowed to add up to unlimited keywords. What is the Website Discovery tool? 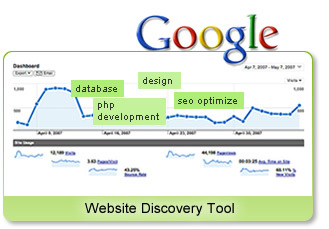 The Website Discovery Tool is a one of a kind weapon for your SEO Arsenal. This tool shows you a list of new keywords for which your website was discovered and clicked on through Google, Bing and other search engines. By 'new keywords', we mean absolutely NEW keywords for which your website has never got a visitor from any search engine from the date you select. Where is the actual benefit of the tool? It is a perfect tool to monitor your the progress of your SEO efforts. Let's say you just started a new website. After say, 4 months, your website starts receiving some traffic from search engine for multiple keywords, say 100 visits from 35 different keywords daily. At this point, there is no way for you to find out if your website was discovered for any new keyword, unless you download your keywords and start comparing manually. This tool will just do this job automatically and make your life so easy. Yes. It is absolutely FREE for now. How can I use this tool? In order to use this tool, you need to have a Google account and Google Analytics tracking installed on your website. You will then have to authorize KPMRS to integrate your Google Analytics account with your KPMRS Account in order to generate this report. We DO NOT ask you to share your email and password. © Galaxy Weblinks Ltd 2019 All rights reserved.